I can’t wait to have you in front of my camera! I will be contacting you soon to schedule your complementary senior portrait session! Also, if you’d like to be become a senior rep, I am looking for two more outgoing, stylist, friendly + kind people! More details to come next week! It’s time to celebrate! I love birthday’s and it just happens to be MY birthday! One of my favorite things about birthday’s are that you get to request your favorite dessert! I can’t say I’ve met a dessert that I didn’t like. I’m not a fan of whipped cream (I know, crazy, right?) so if it doesn’t have whipped cream on it, chances are I will love it! Anything peanut butter + chocolate is my favorite! But cookies, cupcakes, brownies, cheesecake, pie – they are all pretty good to me! To celebrate my birthday I wanted to offer limited edition sessions for 2017 high school seniors. This is something new to KP+Co. and I thought it might be beneficial to some! So what exactly is a limited edition session you ask? Well it is similar to a senior portrait session however, I choose the location, the shoot will last for 20-25 minutes, there will be no outfit changes and you will receive up to 20 digital images with a print release. The cost is $275. Any other products (such as graduation announcements) will be available for purchase. Contact the studio today to reserve your spot! Because my parents divorced when I was very young, my childhood consisted of two birthday’s, two Christmas’, two Valentine’s Days, two summer vacations….two of everything. As a kid, I LOVED this! I loved being spoiled by my parents twice! It was the best! Each house had their own traditions and now that I have four children of my own, we have started some of our own birthday traditions that I hope they will continue when they have families of their own! eating on the red plate: this is one from my childhood; we had a “you are special today’ plate and when it was your birthday, you were able to eat on it. We do this with our children on their birthdays. 13 gifts : when I turned 13, I received 13 gifts and each gift had 13 things inside. I got 13 scrunchies, 13 of my favorite candy bars, 13 one dollar bills, etc. We don’t have a teenager yet but when we do, we will do 13 gifts. dinner with mom + dad only : we do this with our kids on their birthdays. They get to pick where we are going and they get to have a one on one date with just their parents. They seem to really love this tradition! What are some of the birthday traditions you have in your family? I’d love to know! 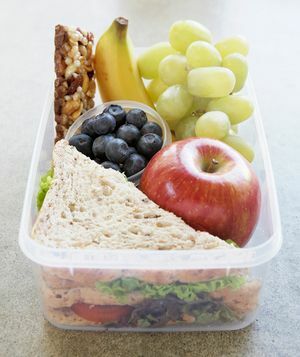 Lunches….if you’re like me, I send a lunch with my kids everyday. Some families require their kids to pack their lunch but I enjoy packing my kids’ lunch + if I do it, I know what’s going into it! I think I grew up on peanut butter + jelly but not my kids. Some like peanut butter and some like jelly but none of them like it together. Here are a few ideas that will hopefully make your lunch making a little easier. I hope some of these ideas will help you with your lunch planning next week! Enjoy!